For some organizations, you will want to keep the members enrolled, but make them Inactive for the time period that they are not actively serving in that organization. If you plan to do this, you may want to select the date that they should go Inactive to use as a reference. See note below regarding Inactive Members and TouchPoint Check-In. Our Deacons actively serve for two years and then they become ‘Inactive’ for a year. We find that it is better to make them Inactive for that year and then change them to Active when they return to active service. There are times when we want to include both Active and Inactive Deacons in mailings or meetings. At the time we enroll new Deacons or make returning Deacons Active, we record the date that they are to go Inactive. For us, that would be a date 2 years in the future. This helps us find them when the time comes to make them Inactive again. You do NOT what you want to use the Inactive member type for people who will need re-register online. An Inactive Member is still considered to be a type of member, so they would not be able to register online. If you do have Inactive members in an org like that, you will need to drop them before they need to re-register. This date will not automatically change the person’s status to Inactive. The date is used as a reference so you can make that change manually. You can set the date for multiple people at the same time and you can make multiple people active (from Inactive) at the same time. It is a very simple process. Go to the organization > Members tab Check the box beside the name of each one you want to assign an Inactive Date and then press Filter . If you want everyone with the same Enrollment Date to be assigned the same Inactive Date, just sort by Join Date, check each one with that same Enrollment Date, then proceed with Step 2 above. You can use Shift-Click: click the top person in the list, hold down the Shift key, and then click the last person. All in between will get selected. Select Members > Update Members . You will see a prompt telling you how many people’s records you will be changing. Select the Inactive Date and click Update . 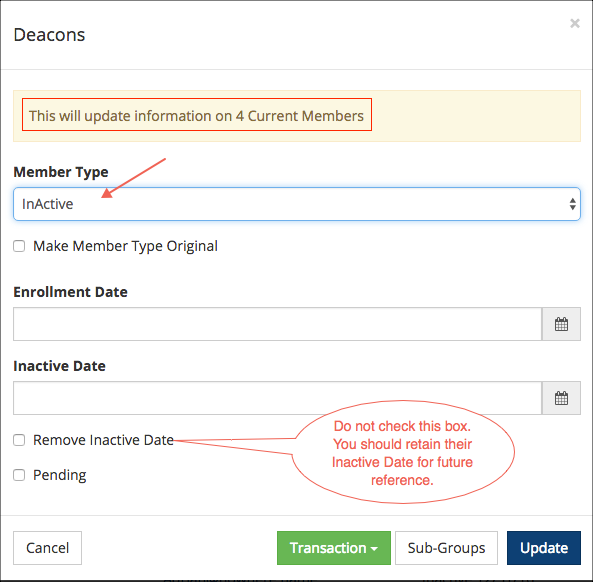 If your members have an Inactive Date set, it is very easy to find them and make them Inactive. Go to the organization > Members tab. Select Date > Inactive Date to sort by that date. Everyone with the same Inactive Date will be together. This is just like the tip above, except that you will select Inactive Date instead of Join Date. Check the box beside the top one in the list that has the Inactive Date you want, hold down the Shift key and check the box beside the last one in the list with that same date. This will put a check mark beside each person you need to make Inactive. Click Filter and note the number of people you are now viewing. It should be the number of members you want to make Inactive. If you do not click Filter and move to the next step, you will be making changes on every member’s record. Select Members > Update Members to open the dialog box. Now select the Member Type of Inactive . Do not check the box to remove the Inactive Date. That will be your clue as to how long the person has remained Inactive. Click blue Update button and then click OK at the prompt. Close the dialog box when the process finishes. This will move all of these members from the Members tab to the Inactive tab. Go to the organization > Inactive tab and select Date > Inactive Date so that all those with the same Inactive Date are together. Select each one to make Active. Because they are all together you can check the box beside the top person, click and hold the Shift key, and then check the box beside the last person. This will select all those in between as well. Click Filter and note the number of people you are now viewing. It should be the number of Inactive members you want to make Active. Select Inactive > Update Inactives to open the dialog box. Now select the Member Type of Member (or whatever Member Type you want to assign to all of them). Select the new Inactive Date , which will be a date in the future when they will rotate off again. That will move all of these from the Inactive tab to the Members tab. You can easily make just one person Inactive. On the organization > Members tab click the person’s Member Type (to open the Member Dialog). Select Inactive as the Member Type . If the person has an existing Inactive Date that is in the future, you will probably want to change it to the current date. This will move that one person from the Members tab to the Inactive tab. You can use a similar process to make one person Active again. Find the person on the Inactive tab, click the Member Type, click Edit, and select the correct Member Type. You probably want to set the new Inactive Date as well. Then click Update . If you use the Inactive tab for normal organizations that are set up to use TouchPoint Check-In, by default, the org will display for an Inactive person in that org when they check in. However, if you do not want the org to display, your System Admin can add a Setting that will prevent orgs from displaying for an Inactive person when he enters his phone number to check in. The Setting is named DisallowInactiveCheckin and the value must be true .